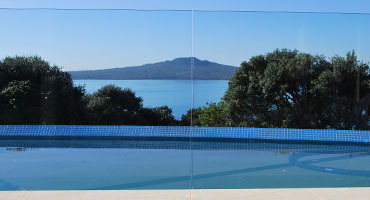 Over a decade of experience designing, painting and installing glass splashbacks in Auckland's kitchens and bathrooms. Toughened glass is extremely easy to clean and is available in a huge range of colours, mirrored styles and prints. Glass splashbacks in a kitchen are toughened to ensure that they can withstand the heat from all types of cooktops. Tile grout can be time consuming to clean and collects grease, stains & dirt. Our glass kitchen and bathroom splashbacks come in a range of styles. We offer standard glossy and matte colours, images and graphics, tinted and antique mirror. A carefully selected colour can either add pop to your kitchen or simply blend in, so as not to clash with your benchtop or another kitchen feature. Colour Glass is back-painted safety glass that can be made to any solid colour. You can be bold and make a statement, you can match another colour present in the room or you can choose a shade or colour that provides just a little bit of contrast. Combined with some smart modern lighting, it will bring a true contemporary feel to your kitchen or bathroom. We commonly match Resene or Dulux colours but also have our own colour range. Arrange a measure and quote and our consultant will bring a small range of samples to your house to discuss options and ideas. Ultra reflective in silvered, bronze, grey or antique. A trendy contemporary look for todays high spec homes. Reflective glass splashbacks are an excellent choice for a modern stand out feature in the kitchen. Always a classy look, mirrors also work to bounce light around the kitchen and open up the cooking space. Ultra reflective is 5mm back-painted, toughened safety glass. You can choose from grey, bronze, dark blue or dark green tint. A new technique involves 'antiquing' during the silvering process to give a cool mirror marbling effect. We love design. We love new ideas. Be bold. Be creative. Lift your kitchen or bathroom with a standout image or graphic splashback. The photographic effect on glass is achieved when any high resolution image (typically above a 3mb file) is printed directly to the back of a toughened ultra clear glass panel. We have used macro shots, printed textures, abstract designs and landscapes in our splashbacks, but there is no restriction to what the subject is. So long as its on file in high resolution, we can expand it and put it on glass for you! If you arent sure of an image just yet, our consultants are more than happy to guide you. Check out istockphoto.com, shutterstock.com and mychillybin.co.nz for large libraries of high resolution images. Back painted frosted glass gives a unique 'perfect consistency' look that appears flatter than any standard wall. Available in a range of bold or subtle colours. Frosted glass when painted diffuses light and gives a 'perfect' flat look that looks even flatter than painted walls. A fairly recent trend in glass splashbacks, it isn't commonplace in homes so you may not have seen many of them.. yet. Come and view samples in our showroom and discover whether the matte look suits your style. Contact us for a quote over the phone, via email, or to arrange to meet a consultant on site. If you havent already chosen your colour or your design, our consultant will have some samples with him and is experienced to help you in the selection process. On acceptance of a quote we will conduct a final measure. The glass is then cut to the accurate shape and measurements and toughened. Edges are polished and the glass is spray painted or printed. When it is dry we will call and arrange the install (installation generally takes 1-2 hours depending on the size of the job). * For graphic / printing jobs there is an additional step where we send a full size proof printed onto paper for you to roll out in position and confirm proceeding. We offer our high quality, high resolution prints direct to glass for use in kitchens bathrooms and feature wall art. What preparations do I need to make before splash glass can be installed? The wall must be generally flat, but not necessarily stopped as the paint we use (or print) is well covered, fully opaque and free of read through. Our consultant can make recommendations on site if anything is necessary. All cupboards benchtops and rangehoods should be installed and in position for a final measure. The glass splashback is typically the last thing to be installed in the kitchen, but you can get the quote and colour selection process under way well before the final measure stage. If its necessary, with a little co-ordinated planning, rangehoods can go up after the final installation (but not after the final measure and before install). 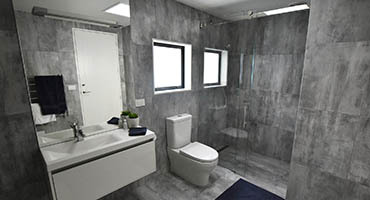 In Bathrooms all relevant waterproofing must be completed prior to installations. What happens with shapes and power points? Internal holes are cut and power points sit on top of the glass as they would the wall (they overlap so there is no gap or silicon around the edge of them). Glass can be cut with curves, corners, notches or shapes provided it can go through the toughening process. Typical things that may be an issue in the toughening process are the distance of internal holes to the edge of the glass (less than 25mm to the edge), and very thin shapes that create weak points. We work around this by splitting the glass into multiple pieces and measuring for the joins to be hardly noticeable, or blend in with the kitchen design. For safety glass in kitchens the maximum length panel that can be toughened is 4200mm for ordinary glass (mild green tint) and 3600mm for ultra clear glass. We use 5mm thick glass in either ultra clear or ordinary 'tint'. Both types are clear glass but ultra clear is manufactured to be low in iron, which takes away that mild green tinge. For this reason we usually use ultra clear and it is necessary with whites, when matching colours or creating the more vivid hues. Ordinary glass splashbacks can be slightly cheaper (by request) but we only recommend this option for very dark colours and when 'oversize' panels are necessary. What colours and images can I choose from? Any colour you can source can be matched, but we recommend sticking to the Dulux or Resene colour ranges. Images can be anything, but a high resolution file is highly recommended (typically sharp and clear at above 4500px width). A good source for high resolution photos is a site like www.istockphoto.com. Patterns and abstract designs are made through creating resizable vectors and these can be made from any 2 to 3 colour graphic youve designed or a pattern you have. Certainly. We can just supply splashback glass to customers, but be careful to provide us with the exact, accurate measurements. Once a panel has been toughened for a splashback, it cannot be trimmed. As a guideline, we generally allow a 3mm tolerance on the width and height - 1.5mm either side. Simple glass panels (no cut-outs) can be purchased at our online store for delivery in Auckland or collection. We provide a warranty of 10 years on the workmanship and for delamination of paint.